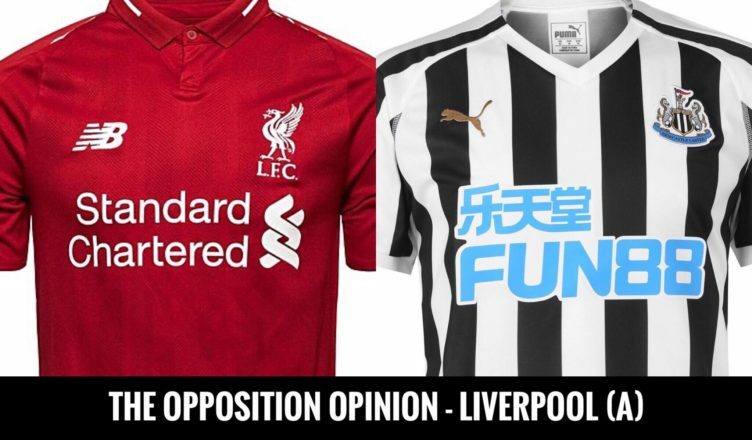 The Opposition Opinion – Liverpool (A) – “S﻿o﻿ ﻿m﻿a﻿n﻿y﻿ ﻿﻿f﻿e﻿e﻿l﻿ ﻿i﻿r﻿k﻿e﻿d﻿ ﻿b﻿y﻿ ﻿h﻿o﻿w﻿ ﻿h﻿e﻿’s ﻿b﻿e﻿i﻿n﻿g﻿ ﻿t﻿r﻿e﻿a﻿t on Tyneside” – NUFC blog – Newcastle United blog – NUFC Fixtures, News and Forum. Ahead of our daunting Boxing day trip to Anfield, we’ve been speaking to Liverpool fan @ScottCGroomfor this week’s ‘Opposition Opinion’ piece. Q1 – I’d ask what you’ve made of your season so far, but unbeaten & 4 clear of City at the top speaks for itself! Do you genuinely think this is your year? “Well it’s been an incredible season so far, there’s very little to complain about for Reds at the moment. The performances on the pitch and our league position speak for themselves, but the feeling around the Club is something I’ve never experienced before. There’s a real togetherness among the fans that’s reflected by the team on the pitch. Klopp has answered his critics and sorted his defence out and we’re winning emphatically and are able to grind out results. Q2 – Could the pressure get to you now you’re top of the pile by a few points & no longer seen as the chasers? The City result was a huge shock, but could complacency creep in at your end as a result? – especially now you’re facing a Newcastle side many of you will see as an easy 3 points..
“If you had asked me this in seasons gone by, I’d have said yes. But I firmly believe that Klopp will not let that happen. The lads seem so focused and in-tune with the task at hand. “There will be a few changes, that’s for sure. Wijnaldum could well come back into the middle to play his former team, and Alexander-Arnold could well start at right back after returning to full training this week. If he doesn’t start, Clyne could be in for a run-out as Milner played at the back against Wolves in the last game. I think the rest of the defence picks itself due to form and injuries, but it’ll be interesting to see who Klopp opts for in midfield. Keita picked up a knock at The Molineux but looks set to be fit, and Shaqiri was unused so could well come in from the start – and he would certainly be one to keep an eye on. He’s been brilliant whenever he’s played so far this season and is so inventive with and without the ball. “Either one of Salah, Mane or Salah could be rested with Lallana or Sturridge coming in to keep some legs fresh. If Fabinho plays again, he would certainly be a danger. If Newcastle let him start dictating play in the middle of the park, Liverpool will overwhelm Newcastle in the middle of the park. Q4 – Which players do you see as the strengths AND weaknesses in this Newcastle’s side? Anyone you’re wary of and anyone you don’t rate? “Salomon Rondon is always a worry for me as he’s quick, strong and has a good eye for goal as well as being a threat in the air. Virgil van Dijk and Dejan Lovren can’t afford to take their eyes off him from set pieces and need to be wary of direct balls into him to bring his team mates into play. “Ayoze Perez is also capable of something special, and Matt Ritchie on his day is a dangerous player. “I think it’ll be quite predictable. Newcastle are likely going to set up in a compact, defensive formation, maybe even with five at the back in a bid to limit the space Liverpool’s forwards have to run into. “Benitez will definitely aim to frustrate Klopp’s men, but I think that Liverpool have got the firepower and guile to work a way around this, and have ample quality in the squad to be able to force their way through. Q6 – Rafa Benitez – As we all know, he was the man who guided you to that famous Champions League trophy. He still seems to be adored on Merseyside and has recently drawn comparisons between both our fanbases and cities. What are your thoughts on him and his situation at Newcastle? Can you see him walking in the summer when his contract expires or do you think he’ll battle on in a bid to get us competing again? “There’s no question that Rafa Benitez is and always will be a legend on Merseyside – not only for what he achieved with the Club, but for the way he embraced Liverpool as a whole, his charity work and the way he conducted himself. “The man is a true gent of the footballing world and commands the uttermost respect, so many Liverpool fans feel irked by how he is being treated on Tyneside. We shouldn’t be surprised, though, as this has always been Mike Ashley’s style and it’s such a shame as Newcastle is a great club with a wonderful history. Q7 – If you could sign one player from this NUFC side, who would you like to see Klopp go for? “Easy question this, Jamaal Lascelles. He’s a brilliant defender who caught the eye last season in particular, and would be a stellar addition to Liverpool’s defensive options. “Recent injuries have highlighted the need for Klopp to get in more centre back options, and Lascelles as a ball-playing defender fits the bill really well. He’s a bit like van Dijk in the sense that he’s a real leader and I think he could be a really useful player for us. Q8 – Finally, do you think there’s any way we can get a result here. We have scored just 14 all season (2nd lowest in league), but Rafa has us so organised away from home, with us being big fans of goalkeeper Martin Dubravka and spoilt for choice at centre back for the first time in years. We’ll no doubt sit deep, get 10 men behind the ball and try to frustrate. If you rotate and don’t have your big guns in from the start, could we see an upset? ” It’s always possible, of course, and I won’t write off that possibility, but I think it’s very difficult to see anything else but a Liverpool win. When you consider our current form and our unbeaten run at Anfield that stretches a very long way (to last season I think! ), it would be something of an upset to see Newcastle walk away from Anfield with even a point. A big thanks to Scott for chatting to us this week, with him clearly feeling there’ll be no complacency in their camp for this one. Next up will be the thoughts of a Watford fan before Saturday’s trip to Vicarage Road. My dad is struggling with Alzheimer’sand it has been linked to his many years of heading the ball. We are working with the Astle foundationas many former players are going through this, but it is a very challengingroad. Many of my dad’s greatest memories were atSt. James’ Park and he still has a great fondness for the Geordies. Please could you help give him a massive memory with a rendition of his NUFCsong “Hallelujah, John Tudor!” in the 10th minute at Anfield onBoxing Day. I know it’s a lot to ask in these days of turmoil and takeovers, but pleaseremember those ex-players that still have to work today and who rated passionhigher than their pay packet. Good luck to the Toon.